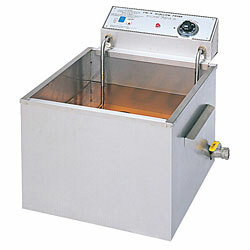 #8068FL Foot Long King Dog Corn Dog Fryer | Pronto Pup Co., Inc.
5750 Watts, 230 Volts, 10”W x 22”D x 19 1/2”H. Great Temperature recovery. Unit is shipped with two, six-position Skewer clips. 50 lb. cooking oil capaciy. Ship weight 40 lbs. Makes up to 12″ Long Pronto Pup corn dogs!